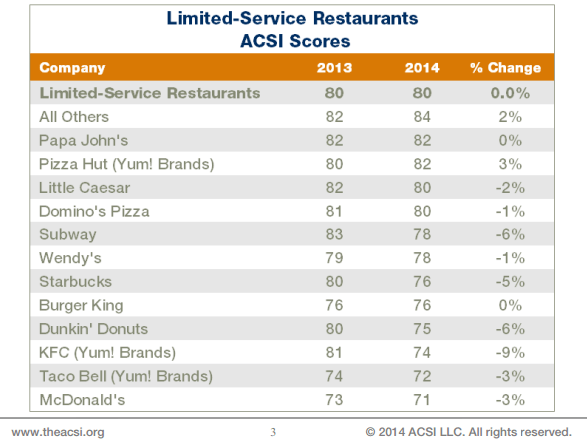 The ACSI (American Customer Satisfaction Index) released the 2014 Restaurant Report. The good news – the economy is improving, with results indicating that consumers ate out an average of four times per week in 2013. This increase, at 60%, is the strongest we’ve seen since the recession started several years ago. According to the recent report, this is great news for the smaller full service restaurant chains, but not so great news for the bigger chains. The results of this study show that customer satisfaction has increased for the smaller restaurants, while bigger names, such as Olive Garden, Red Lobster, and Outback, have fallen. When the economy is weaker, price is more of a factor for consumers; because they have less to spend, they will dine out where it costs less and may overlook a lack of service, or less than stellar service. However, now that signs are pointing to the fact that consumers are feeling comfortable with the economy and are willing to spend more, they are more choosy about where they dine out. Staying competitive is more than offering low prices; as disposable funds are made available to consumers, they become more choosy on where they spend their dollars. It’s not just about price anymore – quality food, a variety of menu items, speed of delivery, and customer service can impact a consumer’s choice. Kudos to the companies who spent the recession years working on maintaining and improving the entire experience; it looks like it is paying off, and they are giving their bigger competitors a run for their money.